For our next week of #30DaysOfBiking, we again didn't ride that many kilometres, despite participating in a big group ride. April 9 I biked the kids to the park (under 2km) just to get on the bike that day. The next day's riding was just preschool dropoff & pickup (4km). 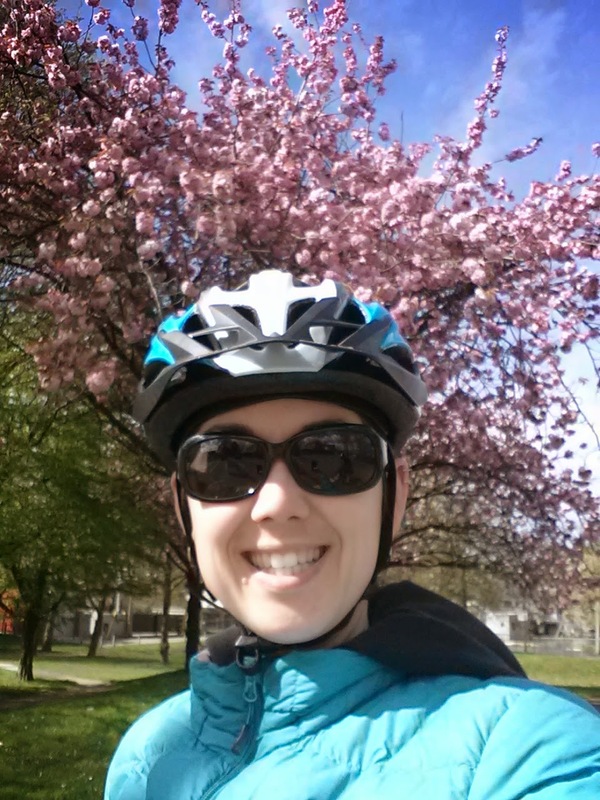 Saturday the 11th was Bike the Blossoms, where I think we rode about 15km underneath the pink trees of East Van. I wrote a recap of the Bike the Blossoms ride here, if you want to read more. Sunday I decided Linnaeus & I would check out an aquarium store in Kitsilano that I'd heard about & run some other errands (13km). Monday was a bit rainy, but not too bad during our quick rides to & from preschool (4km). Tuesday the 14th, the weather was glorious. 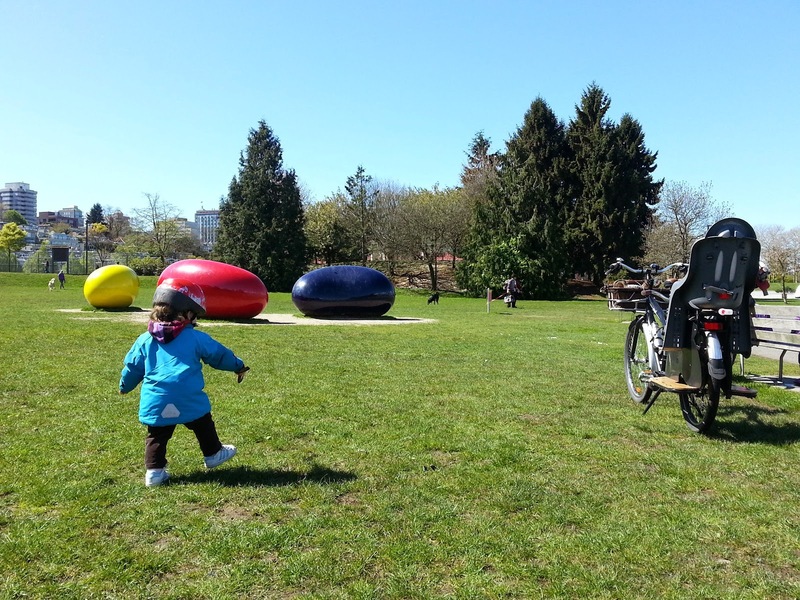 I loaned our trailabike to a friend & her niece & we all rode down to the seawall on False Creek & visited Charleson Park (7km). 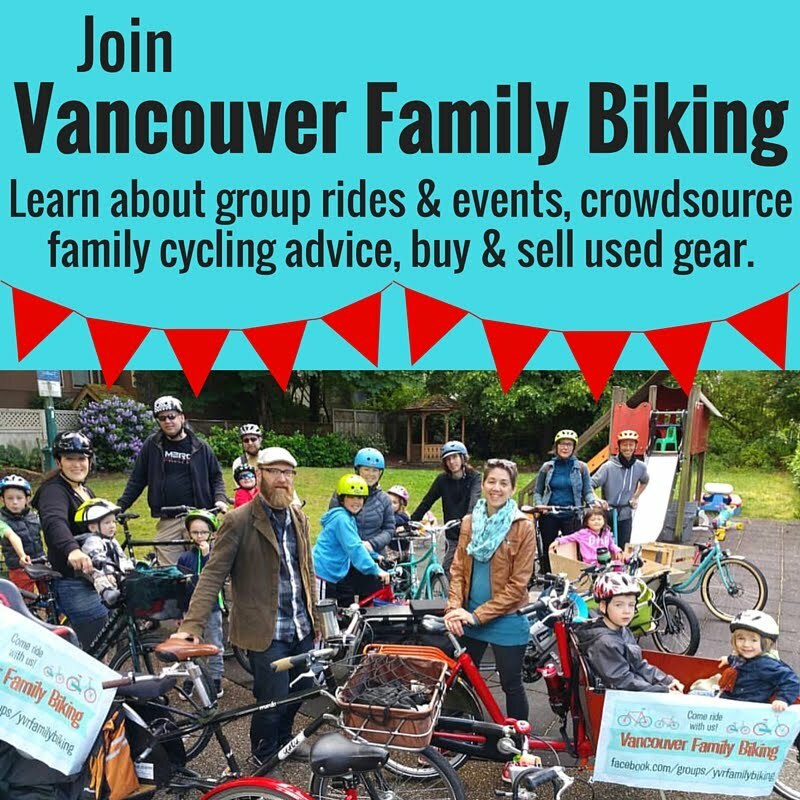 Since we have so much gear for biking with little kids, I love loaning it out & giving other people a taste of how much fun it can be to ride. Wednesday we skipped our usual quick preschool rides because Linnaeus stayed home sick. He wasn't that sick though, so we rode to the park in the afternoon (3km). Now we're at the halfway point of the month & I've added under 50km to my total this month. The point isn't how far, however, it's just that I ride daily, which I've done. About half the time it's just a given that we'll bike somewhere, like preschool or running errands, but there have been a few days that I've had to come up with a reason or ride somewhere that I might ordinarily walk.